If old-school fast-paced 2D platformers are your thing, I had the pleasure of trying out two games from Four Horses at EGX. Kid Tripp and Miles & Kilo are very much two of a kind, taking inspiration from series like Sonic the Hedgehog and Donkey Kong Country. Kid Tripp puts you into the shoes of the eponymous character as he becomes stranded on an island filled with all sorts of mischievous wildlife that are out to get him. 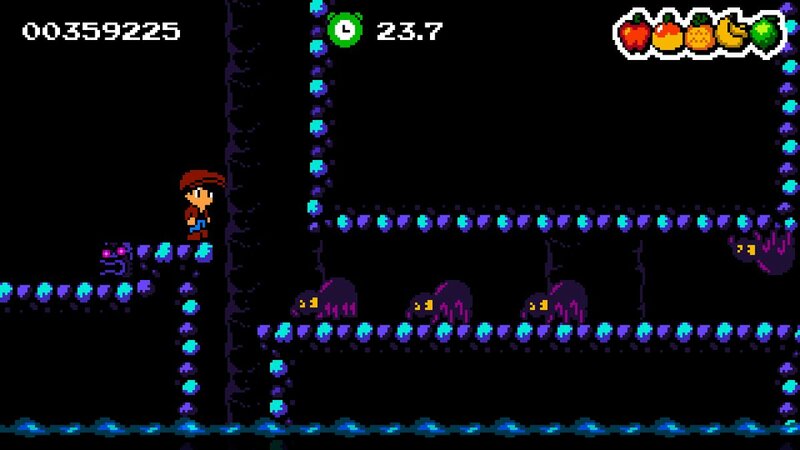 Miles & Kilo acts as a spiritual sequel, taking the familiar jungle island setting and improving the graphics as well as adding in new features that didn't make the cut in the original. These two games have a very simple mechanic that entirely changes how you approach each level: the autorun. In Kid Tripp, you can't stop running unless you hit a wall. It means you've got to think on your feet and choose last-minute decisions that could be crucial in making or breaking a run. 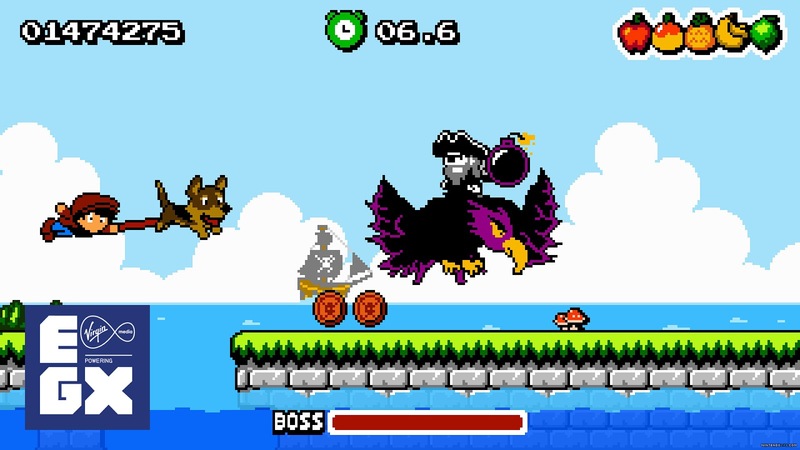 Miles & Kilo actually has two playable characters. Miles is a more typical 2D platformer character. He can run back and forth, jump and throw fruit. His loyal canine companion, Kilo, is more of a wildcard. He runs without being able to stop, rolls through danger and is even capable of performing aerial attacks. While at EGX I had a chat with the brains behind Four Horses, Mick Waites. He is the man responsible for the Nintendo conversions of these two games. Here is what he had to say. Olly Writes: Hi Mick, thanks for chatting. Shall start by going into the background of the development of these two games? Mick Waites: Yeah, absolutely I'll start with Kid Tripp because that is where it all started. I was a frequent visitor to Nintendo Life forums and I discovered Kid Tripp whilst it was in development by a very talented American developer called Mike Burns. At first I thought he was just doing mock-ups of games as a lot of pixel artists do but it turned out he was a programmer as well and it was a fully functional game. I immediately fell in love with it simply from the visuals. At the time I was working in software development and I had access to the 3DS development hardware and I immediately asked if I could get the opportunity to produce a 3DS version. I took apart one of the screenshots of his game and put them into different layers to show him what a stereoscopic 3D screen of the game would look like. Unfortunately, it took about four years for him to be convinced it would be a good idea, because he did have a bigger publisher in mind who were willing to do a version for him but never delivered. So I had later set up Four Horses so I could publish my own game, Digger Dan DX, and then Mike sent me the code and I was able to set up a 3DS version of Kid Tripp fairly quickly. And that was pretty much how we got the game to Nintendo platforms, first on the 3DS and then later on the Switch. OW: And then you worked with Mike Burns again for Miles & Kilo. MW: Yeah, I did. Mike originally developed Kid Tripp on iOS and had never planned for it to be consoles because he wouldn't be able to publish it himself. But there were still loads of things he wanted to add, such as boss battles, wall jumping, and sliding under things. That sort of stuff. He would have just never released the game, so he decided to draw a line under Kid Tripp and call it finished. He then moved on to start work on the sequel by adding in things he couldn't add to Kid Tripp. He was also encouraged by how well his game was received. Kid Tripp received really good reviews and everyone loved it. So he started working on that as I was working on the conversions of Kid Tripp, and when he was happy with the Nintendo versions of it he asked if I would also Miles & Kilo. I couldn't say no, I love these games! OW: It sounds like you both have a great working relationship. MW: Definitely. I don't necessarily see myself as a publisher but that is the role I am in here and it might be a road for me to go down. He says he enjoys working with me and I certainly enjoy working with him. We have discussed future projects and thought about working on something together from scratch if it's something we both want to do. He's certainly got art and design talents that I lack, and he's also got programming talent so I'm not sure why he needs me (laughs). But it is something we'd both like to do. I'm currently working on converting both of these games to other platforms, and I've got a day job too so I'm not ready to commit to doing something new yet. But we would definitely like to. OW: What other platforms are they coming to? MW: Xbox, PlayStation, Vita and Windows. The Vita version may not happen because indications that the platform may not be around for much longer and they've recently stopped production in Japan. I hope not because one of the things we wanted to do with the Nintendo versions was allow cross-platform purchases, but they unfortunately don't support that, but Sony do with Vita and PlayStation 4 so we'd definitely like to. We don't see why players should pay twice for a game. As far as we're concerned, they should be able to buy it once and play it on any platform they want. OW: So how has the player reception been to these two games? MW: In some ways it's been surprising. I think a lot of people don't like the autorun aspect of Kid Tripp and we've had a lot of requests to remove that. Until now I've resisted but since we're releasing on new platforms, I'm tempted to go back and change it and release that as a patch. But the reception has been absolutely great, especially on Switch. We're really happy with it and the people here at EGX have played it and walked away with smiles on their faces. Both games are old-school fun. You pick up and play. You lose a life and you're back in the action straight away, and that's how games should be. OW: Thank you very much for talking to me, Mick. MW: It's my pleasure. It's been great. Having played and completed both games, I can thoroughly recommend either to anyone after a new fast-paced action platformer. They're easy to learn but difficult to master, and part of the fun is trying to beat your previous run by getting ever-so-slightly closer to the finish line. As I kept walking past the booth, I noticed the game was especially popular with children and the seats were never empty. 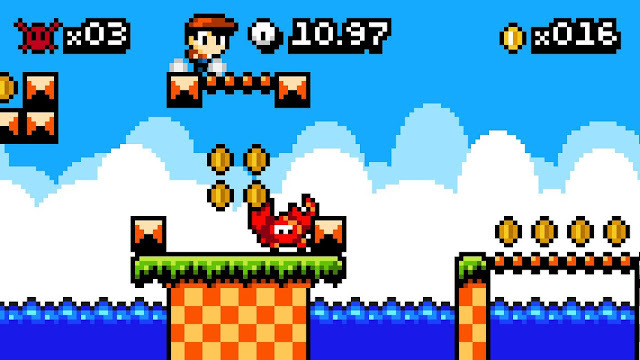 Kid Tripp is available on iOS, Nintendo 3DS and Switch, whereas Miles & Kilo is available on iOS, Switch and Steam with PlayStation 4 and Xbox One versions coming soon.